روچیسٹر، نیویارک وچ پیدا ہوئی، وامباچ پٹسفورڈ دے روچیسٹر اپنگر وچوں اک اچ کھردی وجوں ابھری سی۔ پیٹ اتے جوڈی ومباچ توں پیدا ہوئی اوہ ستّ بھین-بھرا (دو بھیناں اتے چار بھرا) دے سبھ توں چھوٹی سی۔چار سال دی عمر وچ اسنے فٹ بال کھیڈنا شروع کر دتا۔ اوہناں دی ماں نے لائبریری توں اک کتاب دی پڑتال کیتی کہ کھیڈ کویں کھیڈی، اتے ادوں توں فٹ بال اوہناں دے خاندانی پرمپرا دا حصہ بن گیا۔ وامباچ نے اک انٹرویو وچ کیہا "میرے خیال وچ میں جو کرنا چاہندی ہاں، اوہ ہن میں کرنا چاہندی ہاں"۔ "سبھ توں چھوٹی عمر دے ہون دے ناطے ٹیم دے ماحول وچ جو ہندا تسیں اس توں ہر طرحاں دیاں گلاں سکھدے ہو … میں سکھیا کہ کویں مقابلہ کرنا اے، میرے بھرا اتے بھیناں ہمیشہ میرے نال اسے پدھر اتے کھیڈدے ہن اتے اوہ مینوں کدے وی جتن نہیں دندے میں اوہناں نالوں بہتر سی اتے اسدا حقدار سی۔ انے وڈے پروار وچ ہون کرکے تسیں نمر بن جاندے ہو۔ تہاڈے کول کوئی خاص ہنر جاں قابلیت ہو سکدی اے پر ہمیشہ کسے انسان نوں تہاڈے نالوں کجھ بہتر بناؤدی اے۔"
↑ "Timeline: Abby Wambach's soccer career". Democrat & Chronicle. دسمبر 17, 2015. http://www.democratandchronicle.com/story/sports/soccer/2015/06/08/timeline-abby-wambach-soccer-career/28706649/. Retrieved on اپریل 4, 2016. ↑ Redden, Jim (اپریل 3, 2016). "Soccer star Wambach arrested for DUII in Portland". Portland Tribune. http://portlandtribune.com/pt/9-news/300383-178157-soccer-star-wambach-arreste*d-for-duii-in-portland. Retrieved on اپریل 3, 2016. ↑ Steven Goff (10 مئی, 2015). "Abby Wambach scores twice as U.S. women defeat Ireland, 3–0". https://www.washingtonpost.com/blogs/soccer-insider/wp/2015/05/10/abby-wambach-scores-twice-as-u-s-women-defeat-ireland-3-0/. ↑ GatorZone.com, Soccer History, 2001 Roster, Abby Wambach۔ Retrieved 3 مئی, 2011. ↑ "Abby Wambach: American soccer hero". ESPN. جون 19, 2013. http://espn.go.com/espnw/inthegame/8104504/in-game-abby-wambach. ↑ Rogers, Martin (جولائی 15, 2011). "USA’s Wambach was bred for this moment". Yahoo! Sports. https://news.yahoo.com/usa-wambach-bred-moment-185800901--sow.html. ↑ "Washington Freedom 2002 Stats". WUSA. http://wusa.com/stats_standings/washington/. ↑ "Washington Freedom 2003 stats". WUSA. http://www.wusa.com/stats_standings/washington/. ↑ "Abby Wambach". SoccerWay. 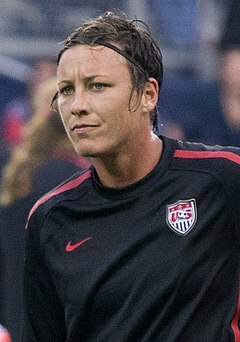 http://us.women.soccerway.com/players/abby-wambach/19423/. ↑ "FIFA Women's World Cup USA 2003: MATCH Report: USA – Sweden: Group matches". FIFA. http://www.fifa.com/tournaments/archive/womensworldcup/usa2003/matches/round=69290100/match=69290005/index.html. ↑ "FIFA Women's World Cup USA 2003: MATCH Report: USA – Nigeria: Group matches". FIFA. http://www.fifa.com/tournaments/archive/womensworldcup/usa2003/matches/round=69290100/match=69290014/index.html. ↑ "U.S. WNT Tops Nigeria, 5–0, in Second Match of Women's World Cup". U.S.Soccer. ستمبر 25, 2003. http://www.ussoccer.com/News/Articles/2003/09/U-S-WNT-Tops-Nigeria-5-0-In-Second-Match-Of-Womens-World-Cup.aspx. ↑ "FIFA Women's World Cup USA 2003: MATCH Report: Korea DPR – USA: Group matches". FIFA. http://www.fifa.com/tournaments/archive/womensworldcup/usa2003/matches/round=69290100/match=69290022/index.html. ↑ "FIFA Women's World Cup USA 2003: MATCH Report: USA – Norway: Quarter-finals". FIFA. http://www.fifa.com/tournaments/archive/womensworldcup/usa2003/matches/round=69290300/match=69290025/index.html. ↑ "U.S. Advances To Semifinals with 1–0 Win Over Rival Norway". U.S.Soccer. اکتوبر 1, 2003. http://www.ussoccer.com/News/Articles/2003/10/U-S-Advances-To-Semifinals-With-1-0-Win-Over-Rival-Norway.aspx. ↑ "FIFA Women's World Cup USA 2003: MATCH Report: USA – Germany: Semi-finals". FIFA. http://www.fifa.com/tournaments/archive/womensworldcup/usa2003/matches/round=69290400/match=69290029/index.html. ↑ "FIFA Women's World Cup USA 2003: MATCH Report: USA – Canada: Match for third place". FIFA. http://www.fifa.com/tournaments/archive/womensworldcup/usa2003/matches/round=69290500/match=69290031/index.html. ↑ "Olympic Football Tournaments Athens 2004 – Women: MATCH Report: Greece – USA: First stage". FIFA. http://www.fifa.com/tournaments/archive/womensolympic/athens2004/matches/round=8681/match=37139/index.html. ↑ "U.S. Olympic Women's Soccer Team Downs Greece 3–0 in Opening Match of Olympics". U.S.Soccer. اگست 11, 2004. http://www.ussoccer.com/News/Womens-National-Team/2004/08/U-S-Olympic-Womens-Soccer-Team-Downs-Greece-3-0-In-Opening-Match-Of-Olympics.aspx. ↑ "Olympic Football Tournaments Athens 2004 – Women: MATCH Report: USA – Brazil: First stage". FIFA. http://www.fifa.com/tournaments/archive/womensolympic/athens2004/matches/round=8681/match=37172/index.html. ↑ "U.S. Women Defeat Brazil 2–0 in Olympics Behind Hamm & Wambach Goals". U.S.Soccer. اگست 14, 2004. http://www.ussoccer.com/News/Womens-National-Team/2004/08/U-S-Women-Defeat-Brazil-2-0-In-Olympics-Behind-Hamm-Wambach-Goals.aspx. ↑ "Olympic Football Tournaments Athens 2004 – Women: MATCH Report: USA – Japan: Quarter-finals". FIFA. http://www.fifa.com/tournaments/archive/womensolympic/athens2004/matches/round=8686/match=37178/index.html. ↑ "U.S. WNT Advances to Olympic Semifinals With 2–1 Victory Over Japan, Will Face Germany on Monday". U.S.Soccer. http://www.ussoccer.com/News/Womens-National-Team/2004/08/U-S-WNT-Advances-To-Olympic-Semifinals-With-2-1-Victory-Over-Japan-Will-Face-Germany-On-Monday.aspx. ↑ "Olympic Football Tournaments Athens 2004 – Women: MATCH Report: USA – Germany: Semi-finals". FIFA. http://www.fifa.com/tournaments/archive/womensolympic/athens2004/matches/round=8687/match=37182/index.html. ↑ "Olympic Football Tournaments Athens 2004 – Women: MATCH Report: USA – Brazil: Gold medal match". FIFA. http://www.fifa.com/tournaments/archive/womensolympic/athens2004/matches/round=8689/match=37185/index.html. ↑ "U.S. Wins Gold Medal on Wambach Overtime Strike". U.S.Soccer. اگست 16, 2004. http://www.ussoccer.com/News/Womens-National-Team/2004/08/U-S-Wins-Gold-Medal-On-Wambach-Overtime-Strike.aspx. ↑ "FIFA Women's World Cup – China 2007: MATCH Report: USA – Korea DPR: First stage". FIFA. http://www.fifa.com/tournaments/archive/womensworldcup/china2007/matches/round=248549/match=56319/report.html. ↑ "Wambach and O'Reilly Score as U.S. Women Tie North Korea, 2–2, to Open 2007 FIFA Women's World Cup". U.S. Soccer. ستمبر 11, 2007. http://www.ussoccer.com/News/Womens-National-Team/2007/09/Wambach-And-Oreilly-Score-As-U-S-Women-Tie-North-Korea-2-2-To-Open-2007-FIFA-Womens-World-Cup.aspx. ↑ "FIFA Women's World Cup – China 2007: MATCH Report: Sweden – USA: First stage". FIFA. http://www.fifa.com/tournaments/archive/womensworldcup/china2007/matches/round=248549/match=56317/report.html. ↑ "Wambach Scores Both Goals as U.S. WNT Rolls Past Sweden in Crucial Group B Match". U.S.Soccer. ستمبر 14, 2007. http://www.ussoccer.com/News/Womens-National-Team/2007/09/Wambach-Scores-Both-Goals-As-U-S-WNT-Rolls-Past-Sweden-In-Crucial-Group-B-Match.aspx. ↑ "FIFA Women's World Cup – China 2007: MATCH Report: Nigeria – USA: First stage". FIFA. http://www.fifa.com/tournaments/archive/womensworldcup/china2007/matches/round=248549/match=56315/report.html. ↑ "FIFA Women's World Cup – China 2007: MATCH Report: USA – England: Quarter-finals". FIFA. http://www.fifa.com/tournaments/archive/womensworldcup/china2007/matches/round=248548/match=56338/report.html. ↑ "U.S. Women Score Three Times in 13 Minutes During Second Half to Blow Open Quarterfinal and Defeat England, 3–0, to Advance to Semifinal of 2007 FIFA Women's World Cup". U.S. Soccer. ستمبر 22, 2007. http://www.ussoccer.com/News/Womens-National-Team/2007/09/U-S-Women-Score-Three-Times-In-13-Minutes-During-Second-Half-To-Blow-Open-Quarterfinal-And-Defeat-En.aspx. ↑ "FIFA Women's World Cup – China 2007: MATCH Report: USA – Brazil: Semi-finals". FIFA. http://www.fifa.com/tournaments/archive/womensworldcup/china2007/matches/round=2000001014/match=56334/report.html. ↑ "FIFA Women's World Cup – China 2007: MATCH Report: Norway – USA: Match for third place". FIFA. http://www.fifa.com/tournaments/archive/womensworldcup/china2007/matches/round=2000001015/match=56333/report.html. ↑ "U.S. Women Defeat Norway, 4–1, to Take Third Place". U.S.Soccer. ستمبر 30, 2007. http://www.ussoccer.com/News/Womens-National-Team/2008/07/U-S-Women-Defeat-Norway-4-0-In-Fredrikstad-Wambach-Scores-99Th-Career-International-Goal.aspx. ↑ "FIFA Women's World Cup – Germany 2011: MATCH Report: Korea DPR – USA: First stage". FIFA. http://www.fifa.com/tournaments/archive/womensworldcup/germany2011/matches/round=255997/match=300144452/report.html. ↑ "FIFA Women's World Cup – Germany 2011: MATCH Report: USA – Colombia: First stage". FIFA. http://www.fifa.com/tournaments/archive/womensworldcup/germany2011/matches/round=255997/match=300144439/report.html. ↑ "FIFA Women's World Cup – Germany 2011: MATCH Report: Sweden – USA: First stage". FIFA. http://www.fifa.com/tournaments/archive/womensworldcup/germany2011/matches/round=255997/match=300144447/report.html. ↑ "U.S. Falls 2–1 to Sweden to Finish in Second Place in Group C at 2011 FIFA Women's World Cup". U.S. Soccer. جولائی 6, 2011. http://www.ussoccer.com/News/Womens-National-Team/2011/07/US-WNT-Falls-to-Sweden-in-Final-Group-Match.aspx. ↑ "FIFA Women's World Cup – Germany 2011: MATCH Report: Brazil – USA: Quarterfinals". FIFA. http://www.fifa.com/tournaments/archive/womensworldcup/germany2011/matches/round=255995/match=300144440/report.html. ↑ "Solo Save Gives USA 5–3 Win Against Brazil in Penalty Shootout to Advance to Face France in FIFA Women's World Cup Semifinal". U.S.Soccer. جولائی 10, 2011. http://www.ussoccer.com/News/Womens-National-Team/2011/07/US-WNT-Defeats-Brazil-in-Dramatic-Penalty-Shootout.aspx. ↑ "FIFA Women's World Cup – Germany 2011: MATCH Report: France – USA: Semi-finals". FIFA. http://www.fifa.com/tournaments/archive/womensworldcup/germany2011/matches/round=255993/match=300144449/report.html. ↑ "U.S. WNT Advances to Final of 2011 FIFA Women's World Cup". U.S.Soccer. جولائی 13, 2011. http://www.ussoccer.com/News/Womens-National-Team/2011/07/US-WNT-Advances-to-Final-of-2011-FIFA-Womens-World-Cup.aspx. ↑ "FIFA Women's World Cup – Germany 2011: MATCH Report: France – USA: Final". FIFA. http://www.fifa.com/tournaments/archive/womensworldcup/germany2011/matches/round=255989/match=300144437/report.html. ↑ "USA Falls in Dramatic Penalty Kick Shootout to Japan in 2011 FIFA Women's World Cup Final". U.S. Soccer. جولائی 17, 2011. http://www.ussoccer.com/News/Womens-National-Team/2011/07/US-WNT-Falls-in-Penalties-to-Japan-in-World-Cup-Final.aspx. ↑ "Women's Olympic Football Tournament London 2012: MATCH Report: USA – France: First stage". FIFA. http://www.fifa.com/womensolympic/matches/round=256031/match=300197641/report.html. ↑ "U.S. Women’s National Team Defeats France 4–2 to Open Group G Play at 2012 Olympics". U.S. Soccer. جولائی 25, 2012. http://www.ussoccer.com/News/Womens-National-Team/2012/07/US-Womens-National-Team-Defeats-France-42-to-Open-Group-G-Play-at-2012-Olympics.aspx. ↑ "Women's Olympic Football Tournament London 2012: MATCH Report: USA – Colombia: First stage". FIFA. http://www.fifa.com/womensolympic/matches/round=256031/match=300197638/report.html. ↑ "U.S. Women’s National Team Clinches Quarterfinal Berth with 3–0 Victory Against Colombia in Group G". U.S.Soccer. جولائی 28, 2012. http://www.ussoccer.com/News/Womens-National-Team/2012/07/WNT-Moves-Closers-to-Olympic-Quarterfinals-with-30-Victory-Against-Colombia-in-Group-G.aspx. ↑ "Women's Olympic Football Tournament London 2012: MATCH Report: USA – Korea DPR: First stage". FIFA. http://www.fifa.com/womensolympic/matches/round=256031/match=300197640/report.html. ↑ "Abby Wambach Goal Gives U.S. Women’s National Team a 1–0 Victory Against Korea DPR and Group G Title at 2012 Olympics". U.S. Soccer. جولائی 31, 2012. http://www.ussoccer.com/News/Womens-National-Team/2012/07/WNT-Finishes-on-Top-of-Group-G-Following-10-Victory-Against-Korea-DPR.aspx. ↑ "Women's Olympic Football Tournament London 2012: MATCH Report: USA – New Zealand: Quarter-finals". FIFA. http://www.fifa.com/womensolympic/matches/round=256041/match=300197658/report.html. ↑ "U.S. Women's National Team Downs New Zealand 2–0 to Advance to Olympic Semifinal in Manchester". U.S. Soccer. اگست 3, 2012. http://www.ussoccer.com/News/Womens-National-Team/2012/08/US-Womens-National-Team-Downs-New-Zealand-20-to-Advance-to-Olympic-Semifinal-in-Manchester.aspx. ↑ "Women's Olympic Football Tournament London 2012: MATCH Report: USA – Canada: Semi-finals". FIFA. http://www.fifa.com/womensolympic/matches/round=256043/match=300197650/report.html. ↑ "Women's Olympic Football Tournament London 2012: MATCH Report: USA – Japan: Final". FIFA. http://www.fifa.com/womensolympic/matches/round=256047/match=300197657/report.html. ↑ "FIFA Women's World Cup Canada 2015: MATCH Report: USA – Australia: First stage". FIFA. http://www.fifa.com/womensworldcup/matches/round=268020/match=300269468/report.html. ↑ "FIFA Women's World Cup Canada 2015: MATCH Report: USA – Sweden: First stage". FIFA. http://www.fifa.com/womensworldcup/matches/round=268020/match=300269500/report.html. ↑ "FIFA Women's World Cup Canada 2015: MATCH Report: USA – Nigeria: First stage". FIFA. http://www.fifa.com/womensworldcup/matches/round=268020/match=300269495/report.html. ↑ "USA Through to Round of 16 After 1–0 Win against Nigeria". U.S.Soccer. http://www.ussoccer.com/womens-national-team/tournaments/2015-fifa-womens-world-cup/150616-wntvnga. ↑ "FIFA Women's World Cup Canada 2015: MATCH Report: USA – Colombia: Round of 16". FIFA. http://www.fifa.com/womensworldcup/matches/round=268032/match=300269505/report.html. ↑ "FIFA Women's World Cup Canada 2015: MATCH Report: China PR – USA: Quarter-finals". FIFA. http://www.fifa.com/womensworldcup/matches/round=268018/match=300269488/report.html. ↑ "FIFA Women's World Cup Canada 2015: MATCH Report: USA – Germany: Semi-finals". FIFA. http://www.fifa.com/womensworldcup/matches/round=268016/match=300269503/report.html.